It may surprise you to learn this, but roller shades in Charlotte are among the most popular of window shade options. Of course, it helps that they are also practical and affordable. Before making any major decisions about your window treatments though, it is important to have a professional to work with to make sense of it all. Here at Sweet Shutters and Shades, we take great pride in our ability to provide exactly what our customers need. From the information required to make a wise decision to quality products to expert installation, we have got you covered. Our Charlotte shutter company realizes you have a great deal of options available and the process can seem overwhelming. Our job is to ensure that you comprehend your possible choices and make the best one, for your unique and individual situation. Our goal is to then provide you with the window treatment options that you will love, for years to come. Call on us today to get started. We'd love to bring samples of our roller shades right to your door with our mobile showroom! Let's schedule your free in-home consultation today. As far as value goes, this is one of the best choices on the market. You get budget-conscious treatments that still offer excellence in performance. There is no need to sacrifice quality in order to stay within your budget. Roller screens enable you to have the best of both worlds. Another reason so many homeowners appreciate roller screens is their simplicity. However, don't let the term simple make you think that you lose elegance along the way. Plus, they are easy to operate. This makes them the all around perfect choice. Another reason people like this type of window covering is that you have the choice for motorization. 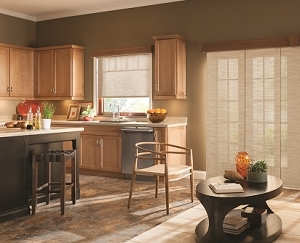 While roller shades are easy enough to use, motorization makes it that much simpler. Don't let the decisions that you make for your window treatments be nothing more than a guessing game. We can lend you our professional expertise, making it possible to get a better grasp on all of the exciting options that you have available, whether you are interested in shutters, shades, blinds or our various selection of window screens. At Sweet Shutters and Shades, we genuinely care about our clients, which is why we offer consultations any day of the week, morning, noon or night. If you are ready to find out more about what we have to offer, all you have to do is get in touch with us today. The only thing standing between your current house and the home of your dreams, is choosing just the right window treatments. If you would like an estimate for roller screens in Charlotte, NC or the surrounding areas, please call Sweet Shutters and Shades at 704-980-4303 or complete our online request form.